No doubt motivated in part by rival Coca-Cola’s unveiling of its Plant Bottle, which contains up to 30 percent bio-based material, Pepsi have just announced that they have produced a bottle which is made up of 100% bio-based raw materials, including switch grass, pine bark and corn husks. By combining biological and chemical processes, PepsiCo said it has identified methods to create a molecular structure that is identical to the current petroleum-based PET (polyethylene terephthalate), which will result in a bottle that looks and feels the same as existing PET beverage containers. 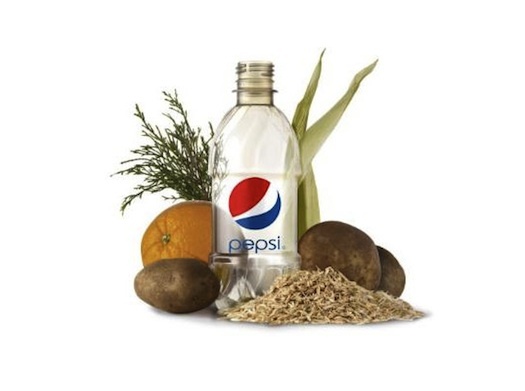 PepsiCo said its “green” bottle is 100 percent recyclable and will allow it to significantly reduce its carbon footprint, and whats even more impressive is the idea that the new bottle will eventually allow for by-products from its food businesses, including potato peels from chips and orange peels from juice to be recycled into bottles. This kind of movement towards a ‘zero waste’ society illustrated by Pepsi is really impressive and will hopefully encourage others so follow suit with similar technologies.